The Avengers...Spider-Man...the Guardians of the Galaxy! You can unite the greatest heroes from all corners of the Marvel Universe for the epic battle that will decide the fate of all realities - MARVEL Future Fight! ASSEMBLE YOUR TEAM! - Create your squad from Avengers like Hulk, Iron Man, and Captain America, as well as other famous Marvel heroes like Spider-Man and Daredevil! Upgrade your weapons and master your skills to give your team the ultimate power-up using a deep RPG leveling system. LIVE THE STORY! - Explore the Marvel Universe in an original story created by acclaimed writer Peter David! EPIC 3v3 BATTLES! - Test your mettle against other players in 3v3 battles! Choose from four unique hero types – Combat, Blast, Speed, and Universal – then pit your champions against your opponents’ teams for supremacy. SINGLE PLAYER CAMPAIGN - Wage epic battle against Super Villains in stage-based battles across a deep, immersive single player RPG campaign to unlock exclusive content, new costumes and rewards! 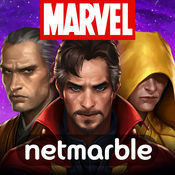 TEAM BONUSES - Team up classic Marvel characters to earn special boosts and bonuses! SUMMON ALLIES - Need a little help to get through the next Super Villain battle? Summon your friends via the Ally System for reinforcements and claim victory as a team! EASY TO USE, ONE-FINGER CONTROLS - Play with just a single finger, or use the virtual control pad to guide your team through the Incursion and defeat your foes!